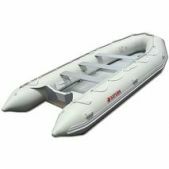 Inflatable boats take up as much space as a medium size bag when deflated, and can be stored almost anywhere, such as a car trunk, closet, or even an empty corner of your apartment. But when inflated, with a hand or electric pump, in a matter of minutes, an inflatable boat can take you or your whole family for a day of fishing, fun and exploration at exhilarating speeds. And best of all, when you're done, just let air out and roll everything back into the bag, till next time. Our boats are heavy-duty, commercial grade, exceptional quality and workmanship watercrafts that are portable when deflated and total fun when blown up with air! Totally rigid, you can hit them with a hummer and nothing happens! And best of all, Saturn inflatable boats are not expensive, not at all, so you can go boating, without stretching your budget!